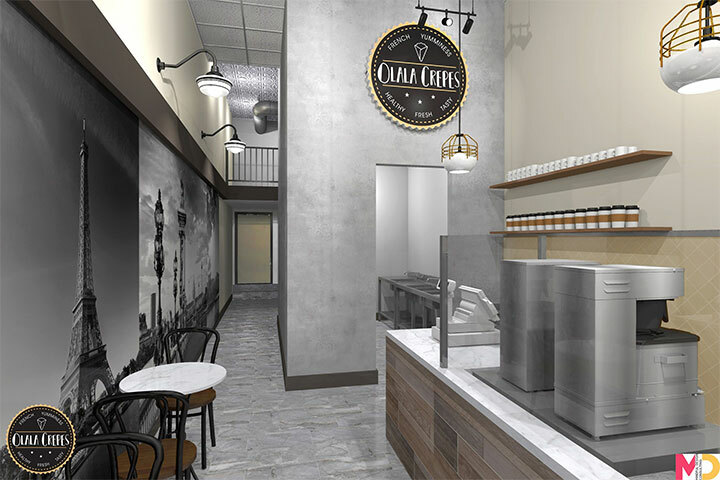 When designing a new space for Olala Crepes in San Diego, we had the chance to develop even further the concept of a crafty hipster-style dessert store infused with Parisian flair. 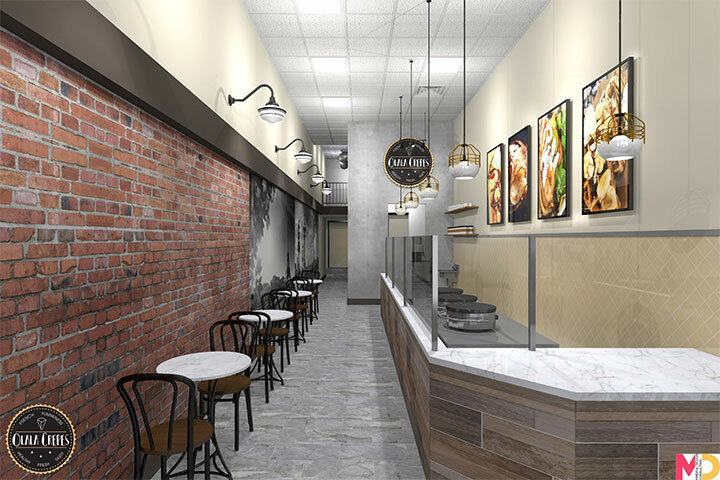 Mindful Design Consulting has already worked on the Olala Crepes kiosk located in the heart of the Liberty Public Market, a laid-back, functional space with warm touches of brown and wood accents. 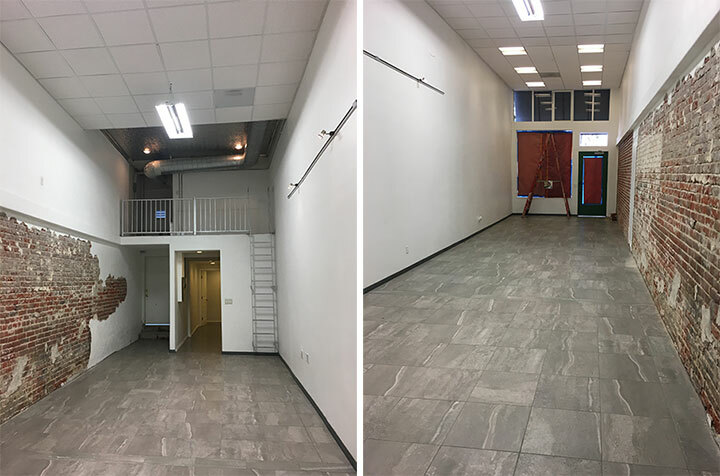 The new store, located at 453 5th Avenue in San Diego takes the concept a little further, by making the French-inspired details a bit more conspicuous. The original space had a handful of shortcomings and some redeeming qualities. Structurally, it was a simple, long and narrow interior with few architectural quirks, that could have easily turned into an unexciting space in the wrong hands. However, we saw in this simplicity an opportunity to create the space we wanted, free from potentially problematic structures. In addition, a brick wall was the perfect detail to evoke the charm of old French streets and buildings, and to capture a bit of architectural nostalgia. 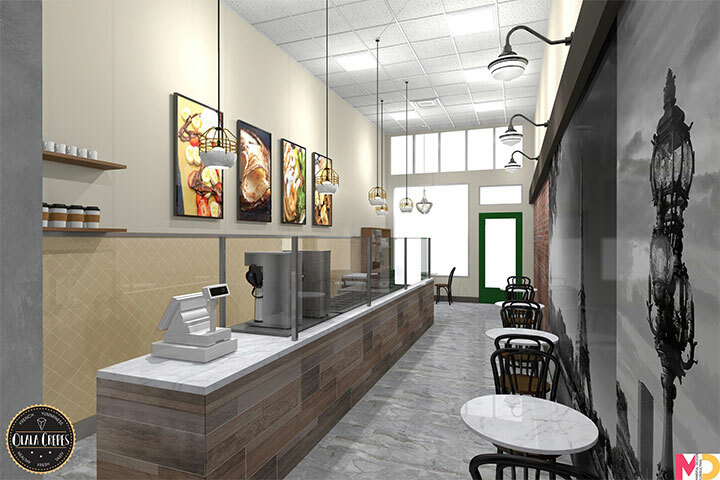 We used the same brown and gold tones that are part of the Olala Crepes brand image and their Liberty Public Market space. Horizontal wood planks line again the front side of the counter, make it look longer and emphasize the length of the interior space. The prepping area is in full view, allowing customers to witness the appetizing show of crepe making. This time, however, we limited the use of dark tones and opted for light hues, a choice demanded by the narrow space that could have otherwise become dim and gloomy. While we took full advantage of natural light coming in through the front door and windows, we added extra lighting. 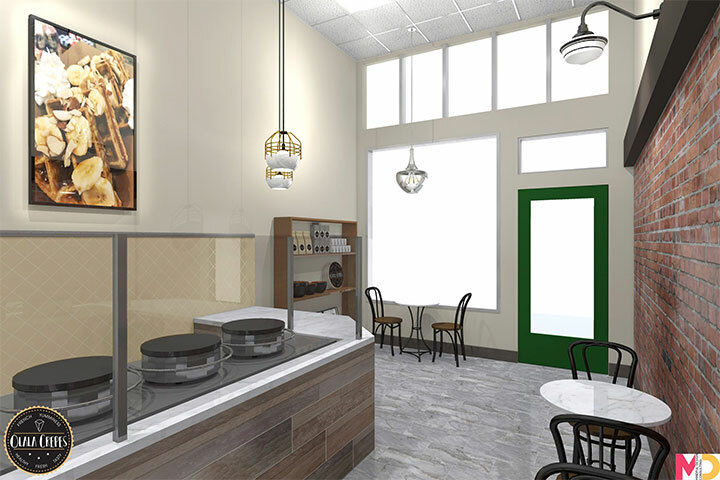 The pendants above the counter have gold accents and a geometric built, but the sconces on the opposite wall are reminiscent of street lights and emphasize the French vibe of the interior. We knew that the danger of a long, narrow space was falling into monotony. To avoid this, we kept half of the brick wall exposed, while we covered the other half with oversize images of Parisian famous sights. We tried to limit the addition of new colors to avoid overwhelming the space, but the black-and-white images also helped create a feeling of nostalgia for simpler times. The tables and chairs call to mind those of Parisian bistros, while a few open shelves keep the place clean and airy. The green entry door and a few large wall pictures add a minimal and well controlled touch of color. The kitchen is hidden behind a wall with a concrete-like faux finish that gives continuity to the neutral floors designed in the same hues. Simple yet charming, the new Olala Crepes interior design mixes character with functionality, while using every corner of the existing space with great efficiency. Please take a look at our Before and After images of selected projects from 2016 HERE.